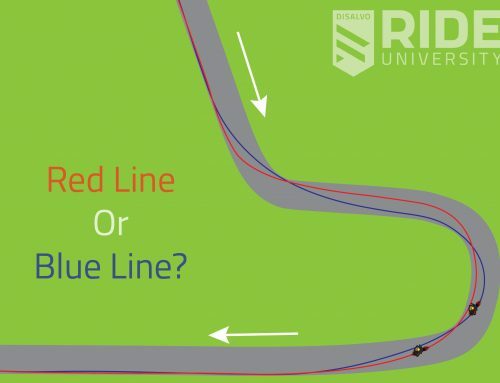 This week we touched on an often misunderstood subject with our red line, blue line challenge. 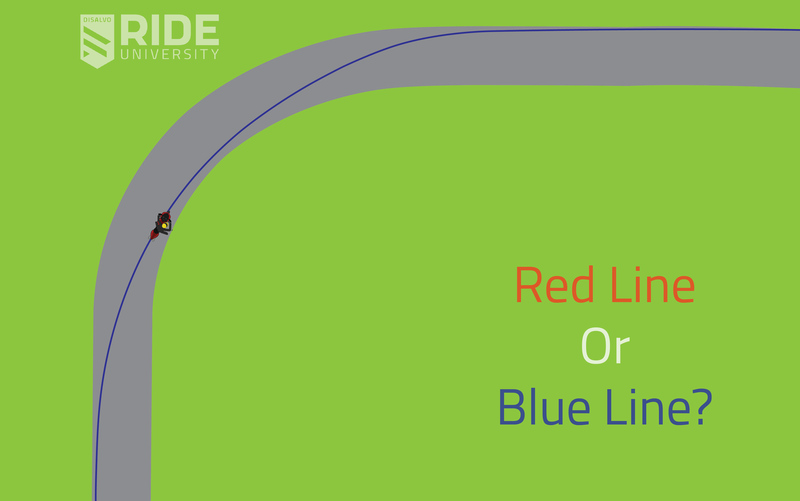 Despite MANY votes for the red line, the BLUE line is our winner for this week. This being said, let’s break down what’s really going on here versus what we’ve been told over the years about cornering. For the people that got this one right, great job! It’s one of the most commonly misunderstood concepts for motorcycle track riding. To preface this discussion, we’re going to be approaching this from purely an on-track perspective, but this applies on the street as well in many instances. We do touch on this fact in our “Braking 2” online course and will be discussing these applications further in our Street curriculum in the future. 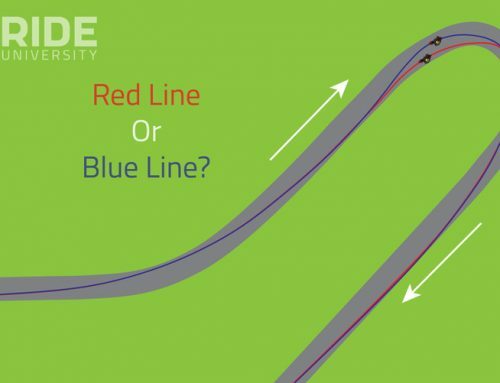 To begin to understand why blue line is the best choice for this turn, let’s start by looking at the biggest drawback to running the red line right from the start: we’re making too tight of a radius by turning in too late for this corner. This approach is an old-school method of “late-apex” cornering that has really never gone away from track riding over the years due to the fact that less skill in controlling our speed is required to run it. This stemmed from the “do all your braking straight up and down” technique that continues to permeate our sport and ultimately puts us into often unfavorable situations where we have very few options if an error occurs. 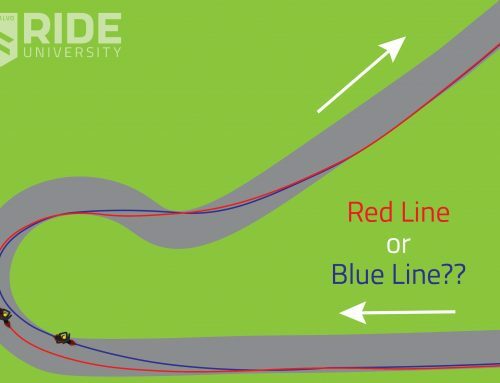 In the above image we can see in the yellow highlighted area how tight our motorcycle’s turning radius is when we’re running on this red line. Because of our RADIUS=SPEED principal, we know that the radius will dictate a VERY slow speed to run this line. 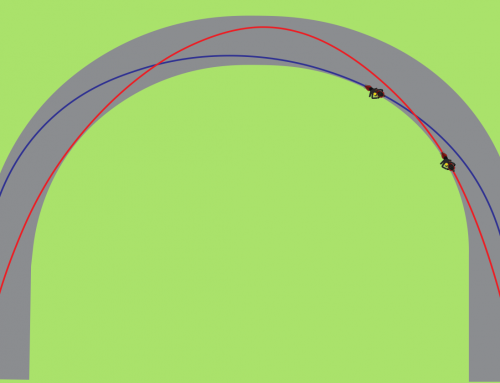 The speed dictated by this tighter radius is so slow in fact, that it negates any of the hypothetical advantages that the red line may present. This is the trap I believe that gets track day riders stuck into this mindset, and not looking at the bigger picture of the overall corner. 1) Getting the best drive because we get the bike turned sooner. 2) Braking deeper because we’re straight up and down longer. 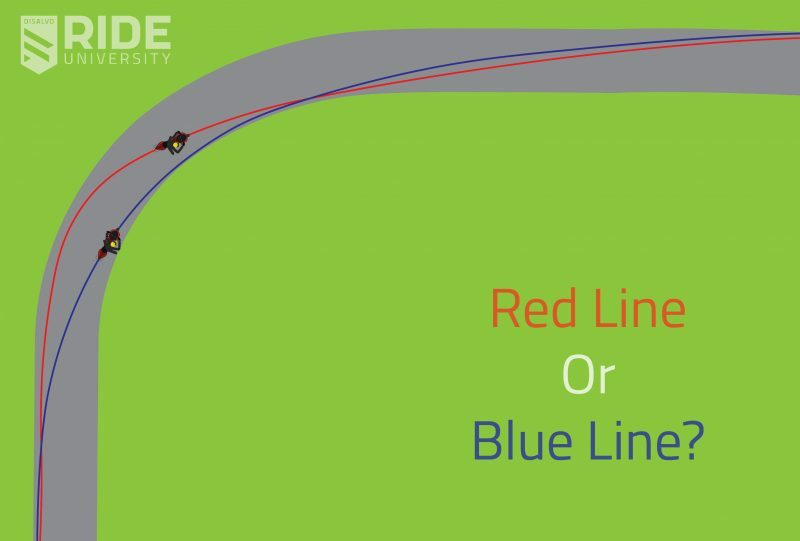 Looking at the first of the recurring comments, it IS true that the red line in this situation gets the bike turned, stood up and taking away lean angle more quickly than the blue. Therefore the ride line rider CAN open the throttle sooner. This would normally be a great thing, except when we start to factor in the the loss of roll speed entering the turn. Accelerating sooner doesn’t always pay off when you’re having to dig out of a deficit as big as we create in this example. To illustrate this, let’s add some values to our map and we can start to see just HOW tight we force ourselves to turn when we have too late of a turn-in. Let’s focus on the 3 factors that really matter for us in this situation. 1) Speed 2) Lean angle 3) Brake pressure. 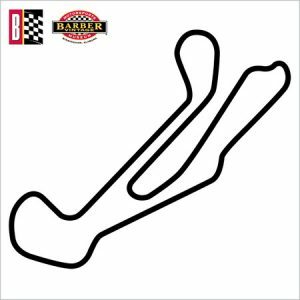 To fully understand the values we’re adding to this map, you can refer to our front tire traction chart and the the lesson in the link just below it. For the important values we’re adding to the map, let’s color code them as well to make this easier to visualize. As you can see the advantage of having a slightly better drive on the exit quickly evaporates when you take into considerations the speed differences that are required by these two different approaches. When we look at the second of the recurring comments from social media, that red line rider is able to brake deeper, we can see there’s no real advantage here either. You’re able to keep slowing more quickly, but since you have to slow to a much lower overall speed, the advantage of maintaining a higher brake pressure for longer is negated as well. Now – both of these points are geared towards achieving the FASTEST way around the track. Not every rider is in the pursuit of that end result so does that mean that blue line is still for them? YES – and here’s why. From the standpoint of simply being a better and SAFER rider, the ability to utilize trail braking in your riding in all situations is important. 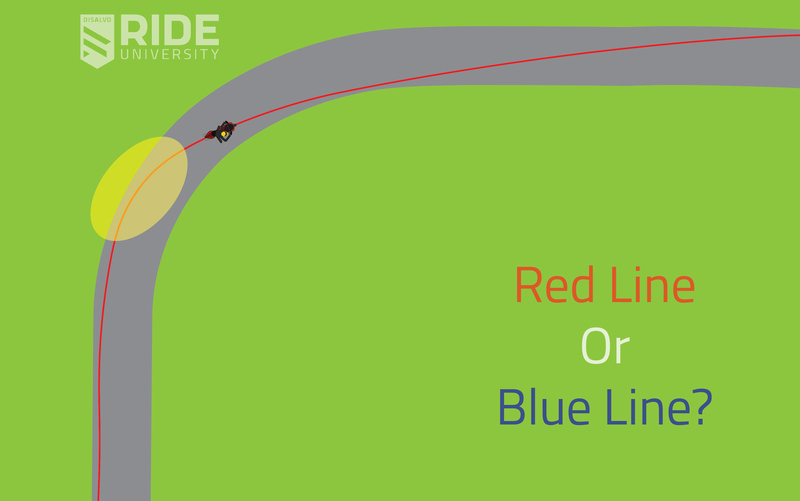 Taking a look at the red line, let’s say that red line rider misses their braking marker by 10-20 yards. This might not be due to the fact that they’re chasing a lap time – it simply may have been a mistake caused by a distraction, poor judgement or any number of things. What happens in this instance? There’s little margin for error on the red line considering they’re tipping in at just about the final moment before they run out of pavement on the left side of the track. That leaves little recourse for any mistakes and ultimately could set us up for a run off into the grass or gravel. Not where we want to be. 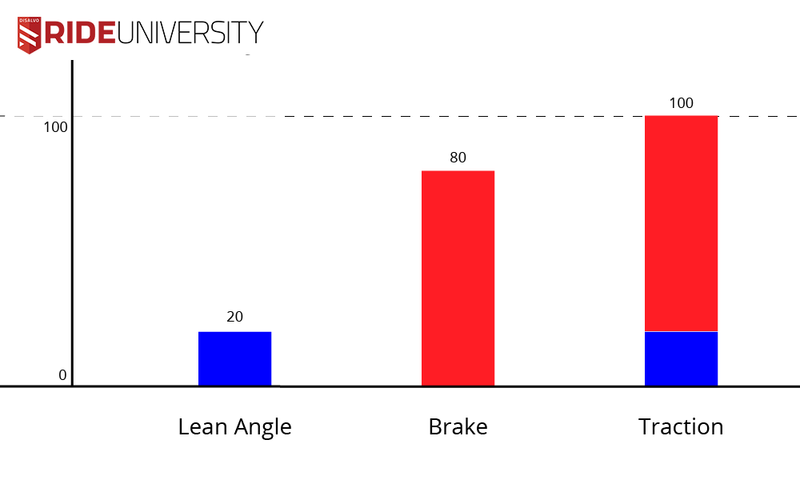 On the other hand, our blue line rider could simply take a moment and maintain brake pressure and lean angle at say 20 lean angle and 80 brakes for a short time to adjust their speed, while still maintaining some turning. Sure they’re going to run bit wide and blow their planned apex a bit, but they can simply slow down to a lower speed and tighten their radius and still probably get a decent drive out of the corner. No issues, no dramas and ultimately a more controlled ride. 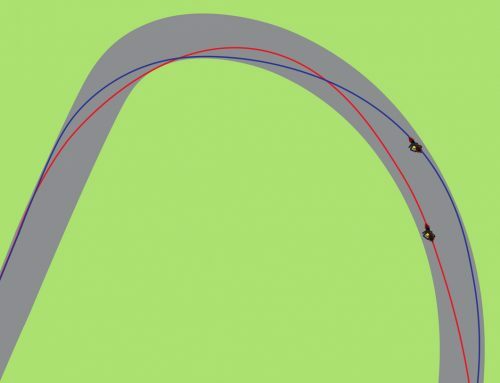 Without the ability to trail brake an control our speed, the radius will never tighten and allow us to properly finish the corner and get the bike pointed where it needs to be on exit. This all comes back to having a solid understanding and good practical experience with trail braking. At our Ride University standalone events this is one of the biggest takeaways that riders at all levels have. From beginner track day riders to seasoned racers, the ability to trail brake opens up all kinds of opportunities to ride with a higher confidence level and greater proficiency than they ever thought possible. If you’re not near us geographically, we also have a great (FREE) online course that covers trail braking, although you definitely want to undertake the drills when you can to gain the practical application experience before you put this to use on the track. Lastly, I want to point out like with most of our red/blue challenge situations that there is a range between these two examples that we’re working towards. 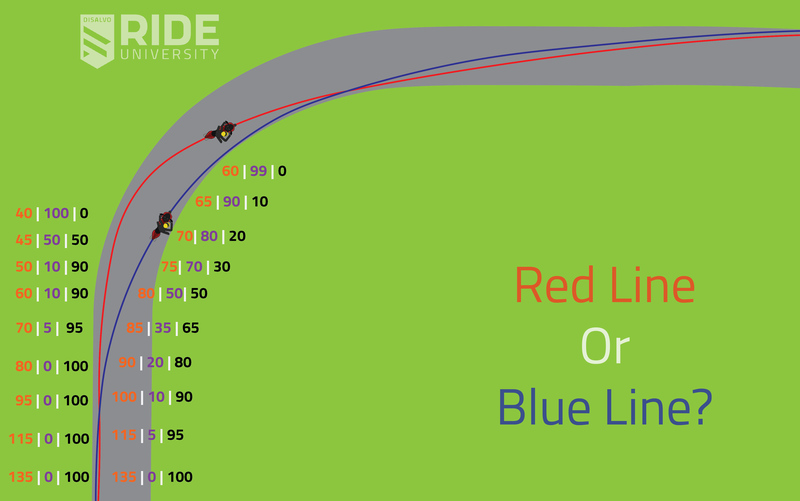 The red line and blue lines are both extremes – everything is variable based on entry speed, bike type, situation, etc etc. It’s the overall concepts that we’re wanting to drive home so if you have any questions make sure to post them here in the forums! Great conversations going about this online on all of our social platforms (forum included). We’re loving the feedback and response of the red/blue challenge series so keep it coming and make sure to share these with all your friends! Setting up the Line – What’s Next on Track?